It's there in the code and various people see it - you can try to pause FG and set the lightning property (somewhere under /local-weather/lightning ) probably to 'true' and look around for the last bolt. But otherwise, your system somehow seems to act up in unexpected ways (see the Shuttle or the CAT-IIIb thing), and I suspect there's one underlying common cause and you're reporting various symptoms - but if for some reason Nasal code isn't executed for you in the sequences the code says, then examining the particular code won't do much. I guess you eventually need to delve into one of these things in detail, try to make the weird behavior appear and go away by changing the code and see what is really called and what not so that the underlying cause becomes apparent. If you wouldn't mind telling me where METAR is parsed by AW that would help - the problem with the CAT IIIB scenario is that FG is not parsed properly, at least in that scenario. So is METAR parsed in Nasal/local-weather, the C++ code, or elsewhere? I realize AW doesn't use METARS as such according to something you wrote on another topic, but it instead translates them somehow to weather fronts, air masses, etc, correct? Basically what I'm looking for is the code that reads the METAR string in Environment/environment.xml thanks! METAR isn't parsed by AW, it's parsed by a C++ routine and AW picks up the individual properties the parser outputs. And it does use METAR as such, it applies some heuristics to determine what's not reported though. Ok - in that case, I want to look at what the C++ routine outputs for FG input. Thanks! This code reads the METAR and gets the phenomenon, setting a boolean to true if it is present. 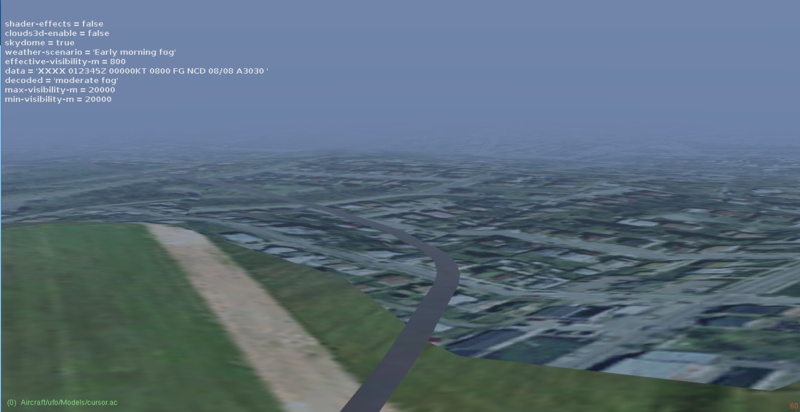 So, none of those properties in /environment/params/fog-mist-haze-layer will be set if 3D clouds are enabled - i.e. FG is completely ignored, and Advanced Weather uses only visibility to create fog. At least, that's the impression I get from reading metarproperties.cxx, I'm not sure if its right or not. Now, I need to see why it ignores visibility when FG is in the METAR string. As for visibility, the minimum visibility is tied to min-visibility-m and the maximum to max-visibility-m - I assume therefore, that is what those properties under environment/ are. 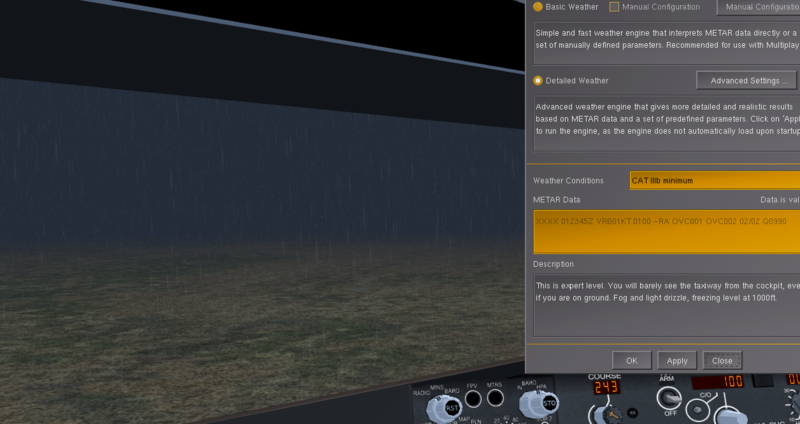 And of course, I need to test in FlightGear with a few custom METAR strings. Notice that despite the same effective-visibility, ALS renders much, much farther. Let's say that I can see clearly from here to the storage tanks, even though I can see further. Using phi, that's a distance of 2.5 miles, or 4000 meters. That's significantly more than the 800m reported. Ok, this might be to do with the bug that wkitty is talking about actually. When I hit z / Z it said Max Visibility, not Visibility!. However, once I had made sure I was definitely in basic weather by opening the dialog again and hitting apply, the actual visibility was 20km. 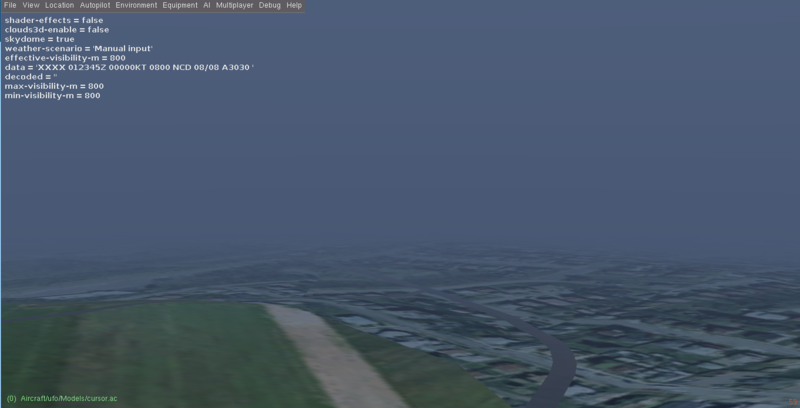 When switching ALS off, the actual visibility reduced to 800m (confirmed in Phi using landmarks about 800m away). ALS on, visibility reduced manually to 800m. 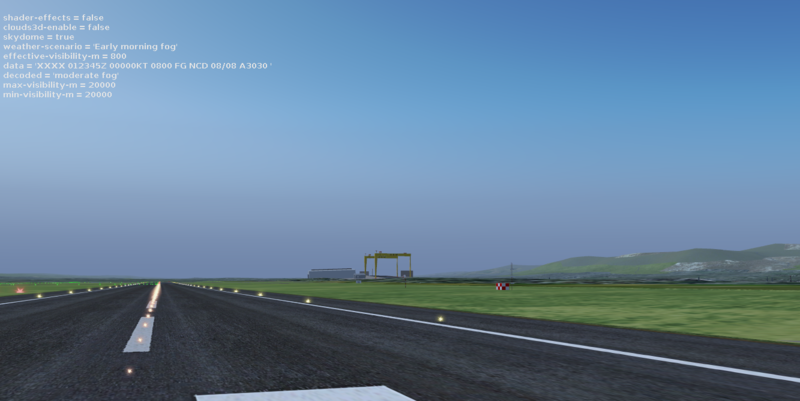 I now set ALS off, visibility to 20km again (although visibility remained at 800m with ALS off), and enabled AW. 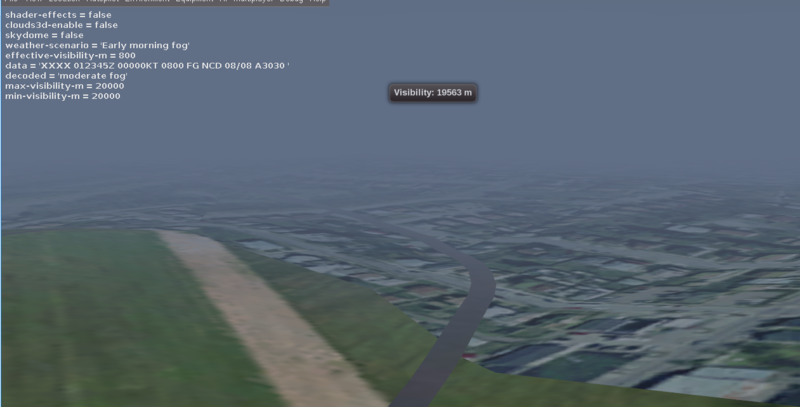 Notice that effective visibility is 20km! Notice that effective-visibility is now 800m, which it never was when FG was reported. Therefore, I conclude that with ALS on, the visibility reported in METAR is ignored in favour of visibility set by the user using the z/Z key. That's bug number 1 - or maybe intended behaviour? I also conclude that AW simply cannot parse fog as set by the "FG" parameter, since it uses 3D clouds, and fog is disabled when 3D clouds are enabled. The real bug here is that when FG is reported, visibility, in this case 800m, is ignored in favour of trying to render fog - which AW cannot do by design, since it uses 3D clouds! Under every combination of AW on / off, ALS on / off, visibility was 800m when FG was removed - I only got 800m visibility with FG in the METAR with ALS and AW off. The fix to me seems simple - set effective-visibility to the reported visibility when FG is in the METAR? But then perhaps that is not done for some reason I am missing? 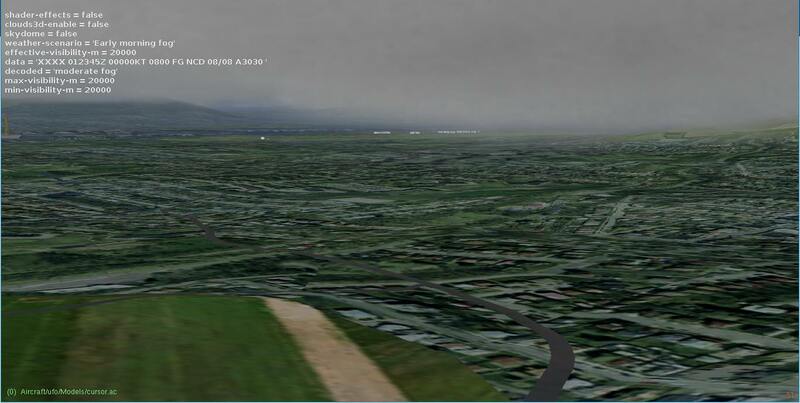 Precisely my point - AW can't render fog when FG is present in the METAR, because it uses 3D clouds. 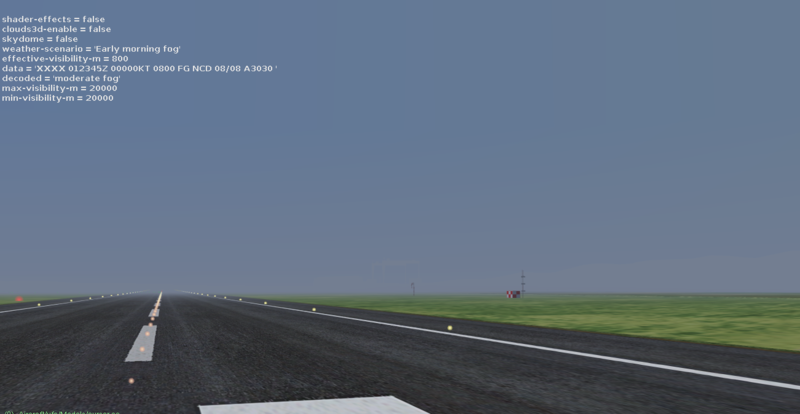 When FG is NOT present in the METAR, it renders fog perfectly, because it sets effective-visibility to 800. 3. Is visibility as you would expect 800 meters? 5. Is visibility increased to 20km, and can you control it with z/Z? 7. Is visibility back to 800 meters or is it 20km again? 8. Is visibility now 800 meters? If anyone on Windows 10 in particular could check this, it would be good. Also @moderators, this isn't really the right topic, maybe it could be split to "Debugging Weather / visibility"? 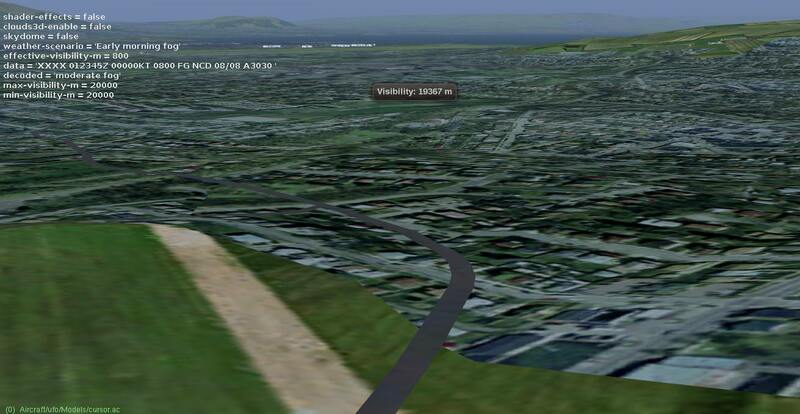 Here it's 800 m in all cases (both /environment/visibility-m and the visuals agree). The only thing is that BW + ALS gets the fog lit much more brightly. Early morning fog still has the issue - although seemingly only on my computer? Okay... I am somewhat surprised - for the heck of it I'm not sure how 3d clouds and lightning (which are like totally different technology) are connected. I always assumed that the 3D clouds option would conflict with AW so never used it (just enabled AW) - so when I saw it0uchpods used them and also had correct visibility I enabled them and got not only working visibility but as an added bonus, lightning and rainshafts!